So we’ve got a few new promos on our hands. Historically, Wizards has used judge and World Magic Cup Qualifier (WCMQ) foils to distribute copies of cards that haven’t been printed in foil before or to add more copies of the card to the market because it is a tournament staple and needs to have a price reduction. Hopefully the Exemplar Program works out and distributes the same, if not more, copies of judge foils to the Magic masses. Because we’ve got some reprints on our hands this time that players have been clamoring about. For additional insight into the price of judge foils, I recommend you read the piece written by Travis Allen last year when judge foil Force of Will and the others were released. It’s a good introduction to this article and will supplement my own opinions for the crop of new judge foils. Numero Uno on the list of reprints, at least from a casual perspective, players finally got their wish. However, be careful what you wish for. What players really wanted was for their Damnations to be reprinted in a much more widely distributed set – say, Modern Masters 2015 or even a Commander release. Why do I suddenly get the feeling that this no longer will be the case? 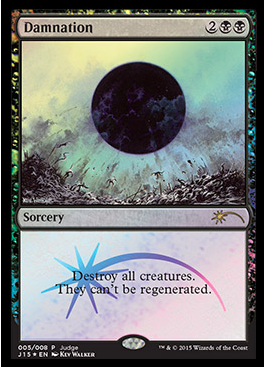 For starters, the inclusion of Damnation in Modern Masters 2015 has an almost zero chance of happening. Crazier things have happened, but I would be pretty surprised if Wizards decided to reprint this in MM in addition to including it as judge foil. That’s a ton of Damnations running around and I don’t think Wizards is quite ready yet to make the price of this card nosedive to Wrath of God levels. When considering Commander, I believe Wizards was remiss about not including it in the C14 Sworn to Darkness deck though I understand their reasoning behind it. Simply put, they didn’t want a True-Name Nemesis situation repeat. The counterargument to this is that Damnation is a not a Legacy staple, and so would be less desired overall than TNN was on its debut simply because it won’t be an auto-include in several Legacy archetypes. I understand this point of view yet I think it severely underestimates the casual demand of this card. Many, many players finally want to get a copy of Damnation that doesn’t cost $45. Based on the value of other cards in the Commander decks, it would have only made the black deck absurdly higher in value than the rest. They could have offset this by printing a higher run of black-only decks but I think Wizards wants to avoid that type of scenario in the future. Thus, we’ve been left with a judge foil compromise. The saddest part about this situation is that it won’t reduce the price of Damnation at all. The judge foils will be worth the same as regular copies (maybe a bit more, at least until the hype dies down) so the only bonus players are getting is that now they have a cheaper foil copy they can pick up. Now in the not-so-distant future, one year or more from the release date, I could actually see the price of this judge foil Damnation fall to below the price of regular copies without a non-foil reprint. The Exemplar Program could actually wind up distributing more copies of judge foils than were on the market in the past. With an overabundance comes a price drop, and the same would be true for Damnation. If the judge foil falls pretty hard, say to $25 or lower, then I feel that is a pretty good price to get in on a casual staple that will be desired by Commander players. Of course, everything I said above becomes completely useless if there is a Modern Masters 2014 or Commander reprint of Damnation this year. If Wizards does decide to bite the bullet on this and give us a non-foil reprint then my advice is to wait for the initial hype to die down, about three months or so, and then to pick up as many copies as you can fit into a suitcase. This card is casual gold and will always have some type of value as the black Wrath. Dualcaster Mage and Feldon were both featured in the Built from Scratch C14 deck and are powerful cards in their own right that can certainly find homes outside artifact-themed Commander decks. For discussion on their non-foil counterparts, I’ll refer you to my previous week’s article. Where foils are concerned, I would imagine that the prices would probably be around $20 to $30 range with the initial hype, however will eventually take an Overwhelming Forces turn and head back down towards the $14-$16 range. One thing I’m not considering in this price is Tiny Leaders hype. 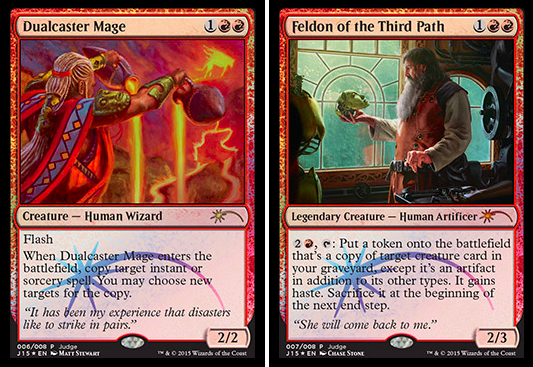 Both cards are pretty decent in the format, and Feldon could even be a Commander, so the price might swing upwards to reflect that. They could even initially be as high as $50 each, though I believe that this price is pretty unsustainable in the short term. Long term, without reprints the foil prices are sure to climb. Either way, wait a bit for the hype to die down, and if you want a foil copy of either card the judge foil will be a nice acquisition. Now, here is a card that Cube enthusiasts and masochistic Commander players wanted to be reprinted! I think we can all agree that Wizards did this reprint right. Ravages of War was clearly a card that was maintaining an out-of-control price based purely on scarcity and not actual card utility. The price of this card is going to drop drastically due to this judge reprint. 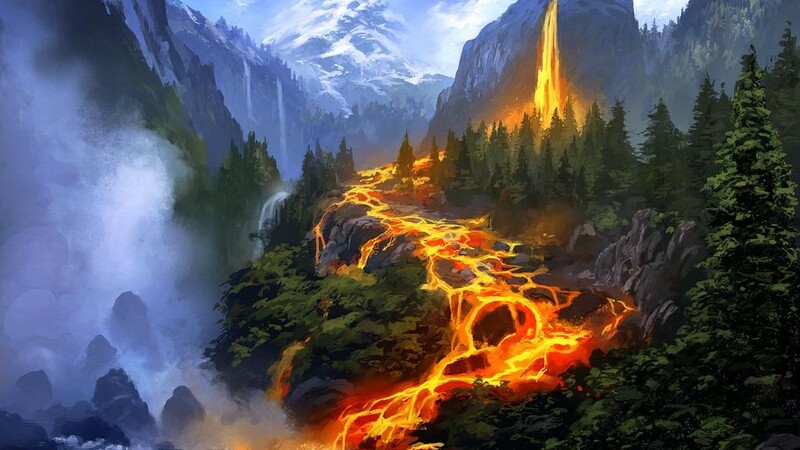 Since not everyone likes land destruction, there will be fewer players seeking out copies which means that this will further add to the price reduction. Do I think it will go below $100? Absolutely. Will it go below $50? That could actually be pretty likely. I think eventually this card will settle somewhere from $35 to $45, if I’m guessing at the demand correctly. If it turns out that everyone wants this card for their cube, I could see it maintaining a price of $60 or higher like the current judge foil Armageddon. Though the only reason that this ‘Geddon has a $60 price tag is because it is the only nice looking foil of the card printed and the printing happened back in 2004, eleven years ago. 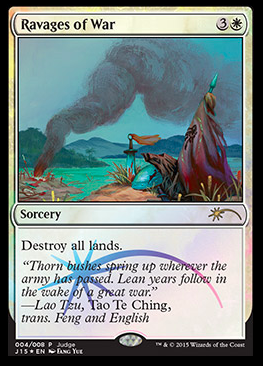 So again, based on casual players hating land destruction and players wanting it only ever needing one for their collection, I feel that $35 to $45 is the eventual sweet spot. However, I don’t think the price will be that low initially, as it will take time to distribute more copies of the card onto the market. So expect prices of $60+ for some time until the card saturates the market. I’m sure this came out of left field for some people. Another judge foil Wasteland reprint? Doesn’t it have two foil reprints already? Geeze, even with it being a freakin’ uncommon in Tempest the cheapest promo copies are $212 currently. Don’t fear though, this price will continue to decline once the new Wasteland hits the market. I think we’ll finally see judge foil Wastelands drop to below $100, which is a great thing for Legacy. It will help more players enter the format, as current players are able to upgrade their non-foil Wastelands, which will put more non-foils on the market for players looking to pick them up. Legacy considerations aside, players do also like to have Wasteland for Commander since it can help get rid of pesky non-basics that might be bugging you. There will be some demand from casual, which will help bolster the price, however it is still coming down with this reprint. Unfortunately, I don’t think this is going to have an effect on the price of Player’s Rewards promos since they feature the original Wasteland art and will always be the most collectable. The first judge foil printings will drop but these Player’s Rewards copies will be collectors items for the most affluent of Legacy enthusiasts. Though, at the end of the day it will be dropping other Wasteland prices across the board, so obviously that’s a good thing. This judge foil reprint of Wasteland makes me think that the non-foil’s price is going to be volatile again this year. 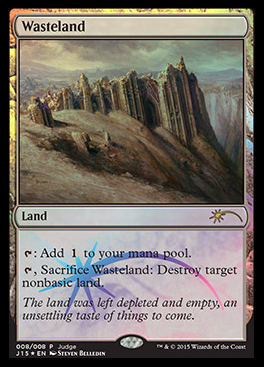 If Wizards continues to reprint Wasteland in this fashion, I think that the non-foil price will only continue to go down. I’m honestly not sure if Wasteland is a good card to hold onto for value anymore. If you guys feel differently, let me know in the comments, but from what I’ve seen pricewise Wasteland is only going down. I mean, just look at that art – this is clearly one of the best pieces Wizards has commissioned for a promotional card. Players are going to want this card, and because it is being distributed at all the WCMQ events there will be plenty of foils entering the market. That pretty much means that foil Thalia is never going above $30 for the foreseeable future. Foil Thalias are currently around $30 per copy, which is significantly different than the non-foil price of $5. WCMQ Geist foils are only $5 less than their set foil counterparts, which means that this WCMQ Thalia foil will probably be around $25 once the dust settles. 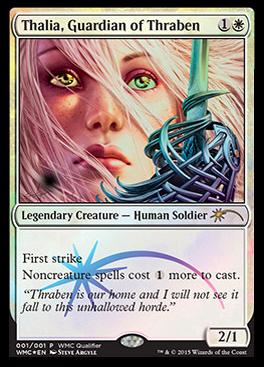 It is possible that some stores will upcharge based on the artwork and popularity of Thalia in Legacy, but I think that ultimately since it is a widely distributed foil that it will fall to slightly below the set foil’s value. Now, the price of the non-foil is an entirely different matter. I think that non-foils at $5 are underpriced due to her popularity in Legacy, Modern, and Commander. Though this article isn’t about the non-foil counterparts, I feel that Thalia non-foils are due for a price increase soon without a reprint in a supplementary product. Between Commander, Duel Decks, Modern Masters, and Promotional Foils, Wizards sure likes to reprint cards these days. Judge Foils and WCMQ foils generally are ahead of the reprint pack in terms of price, due to their print run being somewhat limited compared to the other mass released products. Being foil and sometimes having alternate art also helps their cause, since these additions help the card become more collectable and desirable. However, just like with any other financial Magic endeavour, it’s best to try and get the most for our money. I think that promos like Dualcaster Mage and Feldon will start out high and then come down significantly as more are released into the world. For these types of cards, I would advocate on the side of patience to get the most bang for your buck in terms of promotional cards that you might want for a deck or cube. Interesting piece of writting, especially about the effect of a foil reprint for Wasteland, and the price drop of the regular ones. Considering these, would you go as far as to unload your regular Waste? I feel like these have kept quite a decent value (even though it fluctuated) these last few years; I’m not saying investing in new ones is a good idea, but is unloading them really a good one? If you have a copy / copies of non-foil Wastelands that you regularly play with, I would not recommend getting rid of them. Wasteland will always maintain value, though I don’t expect it to grow similar to the other pricey uncommon in the format Force of Will. However extra Wastelands that people have lying around for future gains are going to start stabilizing now that Wizards is releasing regular extra copies into the market. That and also the indication that Modern will one day replace Legacy makes me think that Wasteland isn’t that great of a place to hold for large future gains. So you’re basically saying that if you’ve already got non-foil Wasteland (wether you use them to play or not), it remains a safe bet to keep them, as they’re unlikely to drop. However, investing in new non-foil copies is not that much a good move, right? Interesting thing you are saying about Force of Will. Can you provide me with more details about that?